Michael E. Mann is Distinguished Professor of Meteorology at Pennsylvania State University and contributed to the International Panel on Climate Change work that received the 2007 Nobel Peace Prize. His book The Hockey Stick and the Climate Wars: Dispatches from the Front Lines (Columbia University Press, 2012) is in paperback, with a foreword by Bill Nye the Science Guy. “Temperatures have been flat for 15 years—nobody can properly explain it,” the Wall Street Journal says. “Global warming ‘pause’ may last for 20 more years, and Arctic sea ice has already started to recover,” the Daily Mail says. Such reassuring claims about climate abound in the popular media, but they are misleading at best. Global warming continues unabated, and it remains an urgent problem. The misunderstanding stems from data showing that during the past decade there was a slowing in the rate at which the earth’s average surface temperature had been increasing. The event is commonly referred to as “the pause,” but that is a misnomer: temperatures still rose, just not as fast as during the prior decade. The important question is, What does the short-term slowdown portend for how the world may warm in the future? The Intergovernmental Panel on Climate Change(IPCC) is charged with answering such questions. In response to the data, the IPCC in its September 2013 report lowered one aspect of its prediction for future warming. Its forecasts, released every five to seven years, drive climate policy worldwide, so even the small change raised debate over how fast the planet is warming and how much time we have to stop it. The IPCC has not yet weighed in on the impacts of the warming or how to mitigate it, which it will do in reports that were due this March and April. Yet I have done some calculations that I think can answer those questions now: If the world keeps burning fossil fuels at the current rate, it will cross a threshold into environmental ruin by 2036. The “faux pause” could buy the planet a few extra years beyond that date to reduce greenhouse gas emissions and avoid the crossover—but only a few. The dramatic nature of global warming captured world attention in 2001, when the IPCC published a graph that my co-authors and I devised, which became known as the “hockey stick.” The shaft of the stick, horizontal and sloping gently downward from left to right, indicated only modest changes in Northern Hemisphere temperature for almost 1,000 years—as far back as our data went. The upturned blade of the stick, at the right, indicated an abrupt and unprecedented rise since the mid-1800s. The graph became a lightning rod in the climate change debate, and I, as a result, reluctantly became a public figure. In its September 2013 report, the IPCC extended the stick back in time, concluding that the recent warming was likely unprecedented for at least 1,400 years. Although the earth has experienced exceptional warming over the past century, to estimate how much more will occur we need to know how temperature will respond to the ongoing human-caused rise in atmospheric greenhouse gases, primarily carbon dioxide. Scientists call this responsiveness “equilibrium climate sensitivity” (ECS). ECS is a common measure of the heating effect of greenhouse gases. It represents the warming at the earth’s surface that is expected after the concentration of CO2 in the atmosphere doubles and the climate subsequently stabilizes (reaches equilibrium). The preindustrial level of CO2 was about 280 parts per million (ppm), so double is roughly 560 ppm. Scientists expect this doubling to occur later this century if nations continue to burn fossil fuels as they do now—the “business as usual” scenario— instead of curtailing fossil-fuel use. The more sensitive the atmosphere is to a rise in CO2, the higher the ECS, and the faster the temperature will rise. ECS is shorthand for the amount of warming expected, given a particular fossil-fuel emissions scenario. It is difficult to determine an exact value of ECS because warming is affected by feedback mechanisms, including clouds, ice and other factors. Different modeling groups come to different conclusions on what the precise effects of these feedbacks may be. Clouds could be the most significant. They can have both a cooling effect, by blocking out incoming sunlight, and a warming effect, by absorbing some of the heat energy that the earth sends out toward space. Which of these effects dominates depends on the type, distribution and altitude of the clouds— difficult for climate models to predict. Other feedback factors relate to how much water vapor there will be in a warmer atmosphere and how fast sea ice and continental ice sheets will melt. Because the nature of these feedback factors is uncertain, the IPCC provides a range for ECS, rather than a single number. In the September report—the IPCC’s fifth major assessment—the panel settled on a range of 1.5 to 4.5 degrees Celsius (roughly three to eight degrees Fahrenheit). The IPCC had lowered the bottom end of the range, down from the two degrees C it had set in its Fourth Assessment Report, issued in 2007. The IPCC based the lowered bound on one narrow line of evidence: the slowing of surface warming during the past decade—yes, the faux pause. Many climate scientists—myself included—think that a single decade is too brief to accurately measure global warming and that the IPCC was unduly influenced by this one, short-term number. Furthermore, other explanations for the speed bump do not contradict the preponderance of evidence that suggests that temperatures will continue to rise. For example, the accumulated effect of volcanic eruptions during the past decade, including the Icelandic volcano with the impossible name, Eyjafjallajökull, may have had a greater cooling effect on the earth’s surface than has been accounted for in most climate model simulations. There was also a slight but measurable decrease in the sun’s output that was not taken into account in the IPCC’s simulations. Natural variability in the amount of heat the oceans absorb may have played a role. In the latter half of the decade, La Niña conditions persisted in the eastern and central tropical Pacific, keeping global surface temperatures about 0.1 degree C colder than average—a small effect compared with long-term global warming but a substantial one over a decade. Finally, one recent study suggests that incomplete sampling of Arctic temperatures led to underestimation of how much the globe actually warmed. None of these plausible explanations would imply that climate is less sensitive to greenhouse gases. 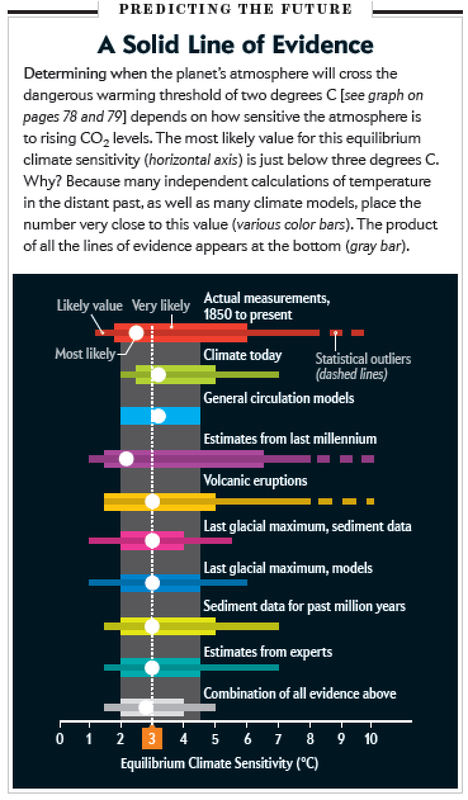 Other measurements also do not support the IPCC’s revised lower bound of 1.5 degrees C. When all the forms of evidence are combined, they point to a most likely value for ECS that is close to three degrees C. And as it turns out, the climate models the IPCC actually used in its Fifth Assessment Report imply an even higher value of 3.2 degrees C. The IPCC’s lower bound for ECS, in other words, probably does not have much significance for future world climate—and neither does the faux pause. For argument’s sake, however, let us take the pause at face value. What would it mean if the actual ECS were half a degree lower than previously thought? Would it change the risks presented by business-as-usual fossil-fuel burning? How quickly would the earth cross the critical threshold? 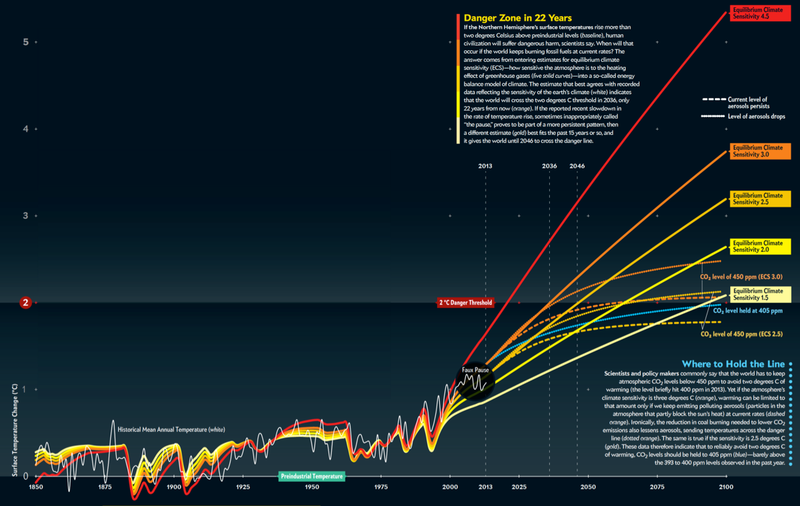 To my wonder, I found that for an ECS of three degrees C, our planet would cross the dangerous warming threshold of two degrees C in 2036, only 22 years from now. When I considered the lower ECS value of 2.5 degrees C, the world would cross the threshold in 2046, just 10 years later. We are well on our way to surpassing these limits. In 2013 atmospheric CO2 briefly reached 400 ppm for the first time in recorded history—and perhaps for the first time in millions of years, according to geologic evidence. To avoid breaching the 405- ppm threshold, fossil-fuel burning would essentially have to cease immediately. To avoid the 450-ppm threshold, global carbon emissions could rise only for a few more years and then would have to ramp down by several percent a year. That is a tall task. If the ECS is indeed 2.5 degrees C, it will make that goal a bit easier. Even so, there is considerable reason for concern. The conclusion that limiting CO2 below 450 ppm will prevent warming beyond two degrees C is based on a conservative definition of climate sensitivity that considers only the so-called fast feedbacks in the climate system, such as changes in clouds, water vapor and melting sea ice. Some climate scientists, including James E. Hansen, former head of the nasa Goddard Institute for Space Studies, say we must also consider slower feedbacks such as changes in the continental ice sheets. When these are taken into account, Hansen and others maintain, we need to get back down to the lower level of CO2 that existed during the mid-20th century— about 350 ppm. That would require widespread deployment of expensive “air capture” technology that actively removes CO2 from the atmosphere. Furthermore, the notion that two degrees C of warming is a “safe” limit is subjective. It is based on when most of the globe will be exposed to potentially irreversible climate changes. Yet destructive change has already arrived in some regions. In the Arctic, loss of sea ice and thawing permafrost are wreaking havoc on indigenous peoples and ecosystems. In low-lying island nations, land and freshwater are disappearing because of rising sea levels and erosion. For these regions, current warming, and the further warming (at least 0.5 degree C) guaranteed by CO2 already emitted, constitutes damaging climate change today. Let us hope that a lower climate sensitivity of 2.5 degrees C turns out to be correct. If so, it offers cautious optimism. It provides encouragement that we can avert irreparable harm to our planet. That is, if—and only if—we accept the urgency of making a transition away from our reliance on fossil fuels for energy.